After my first attempts at uploading music failed, I decided that the only way to get further into the uploading process with any prospect of success was to convert all songs in my library to mp3 files. Most of my library is in WMA format. It took two days to convert all songs in my library to mp3 files. I used the conversion utility that comes with the free version of Real Player (http://www.real.com). I then tried to upload music to the Amazon Cloud. Thus far I have uploaded about two thousand audio tracks. Amazon never recognizes all the songs—ever when they sell the identical songs on their website and I ripped them from a factory CD. 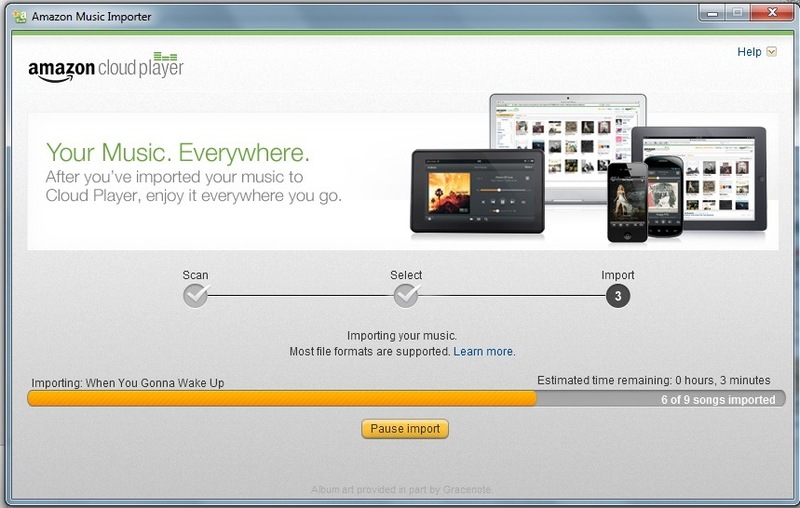 On average, out of a block of 200 or more songs, the cloud service will identify about 35 to 40 percent of the music. Just as a test for this blog posting, I tried the Grammy Award winning album by Bob Dylan Slow Train Coming. As you can see in the attached screen shot, Amazon correctly identified only six of the nine songs; the other three had to be uploaded individually. Amazon recognizes some tracks on Dylan CD. Once the music is uploaded, other catastrophes were waiting to be worked-out. Many songs from the same CD were split into five or six “albums” even thought they were ripped from a single commercially purchased CD and uploaded at the same time. Trying to fix these errors is frustrating and very time consuming. Whether you use the back button or other navigation links in the Cloud Player, you end-up not where you were just working but at the beginning of the list of albums. In addition, the suggestions from the Cloud Player for artist, album and track number are frequently wrong—even when Amazon sells the same CD on their website. Perhaps working in multiple monitors and multiple browser sessions would allow fixing these errors quickly. Once you think you have all the bugs worked out on a particular album, you have no visible indicator to let you know if Amazon matched a music track with their library or what bit rate a song is in unless you actually download it. I have gone to great lengths to use correct year for album release dates in my library however this information only confuses the music identification routine used by Amazon’s software. Amazon favors the date they made something available for download not the year the album or CD was released originally. So far I have mixed opinions about the Amazon Cloud Player.